One of my art history classmates gave a presentation about Fontana dei Quattro Fiumi, or the Fountain of Four Rivers. It is a stunning piece of Baroque architecture designed by Bernini and located in Rome. I was very taken with the photographs of the fountain and thought it was beautiful. I didn’t know much about Rome prior to leaving for the trip, but that fountain was one of the few items on my “To see” list. 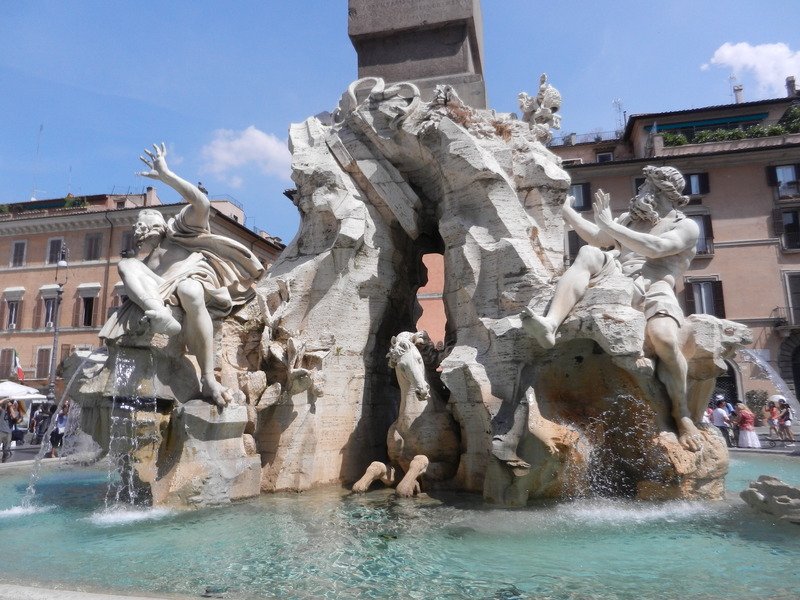 When I discovered it was located in Piazza Navona, one of my assigned tour spots, I was very eager to visit it. 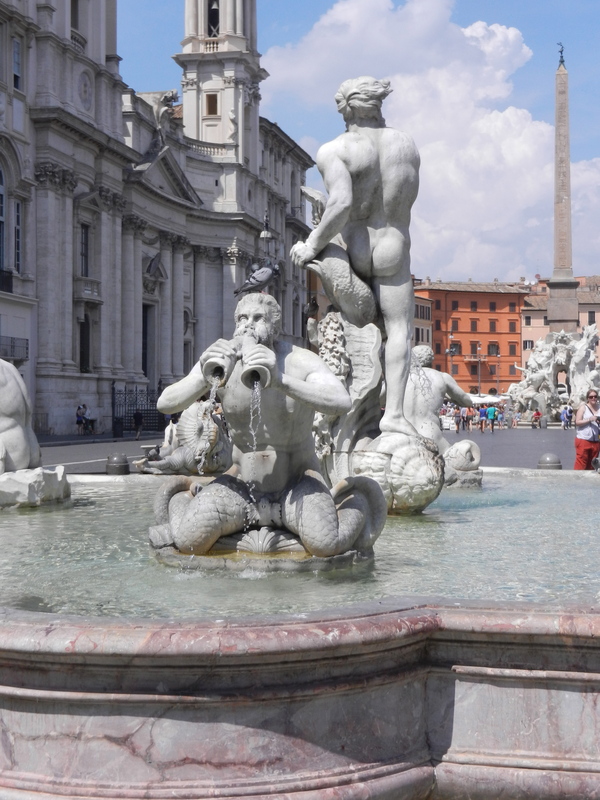 On the first free weekend I embarked on an excursion with two other group members to see Piazza Navona. We hadn’t quite gotten a feel for the city yet so it took a lot of wandering and various failed attempts at map reading to find it. We truly looked like tourists as we wandered about with question marks above our heads and our maps turned every which way. Our lack of navigation skills led us down many small side streets that seemed to go nowhere at all. The pulsing Rome heat was of no help either and only slowed our thought processes and clouded our vision with beads of sweat. Practically overcome by heatstroke, we walked through an alley, emerged in the piazza, and were greeted by the backside of Fontana del Moro. A marble derrière wasn’t quite what I expected to find, but I was too relieved to have reached the piazza to care. Behind the fountain, though, stood Fontana dei Quattro Fiumi in all of its glory. It was a magnificent site to behold in person. The artistry and skill behind the sculpting was evident at first glance, and the attention to detail was impeccable. The massive fountain required a bit of time and maneuvering through crowds to circumnavigate, but it was worth every scusi I had to utter. Behind this great fountain was a third, Fontana dei Nettuno. This fountain was dedicated to Neptune and featured a giant sculpture of the great sea god in its center. Surrounding the fountains were various artists selling their paintings and prints, and, of course, many tourists. Even though the artists were not all authentic, Piazza Navona really represented what I pictured Europe would be like. It was a huge gathering space for tourists and locals alike, and artists had work displayed at every turn. Piazzas provided a chance to gather and relax for a little bit during a hectic day in the city. I grew tired of crowds and although Piazza Navona was usually filled with them, it remained my favorite spot in the city.